Experts announce more rain in the coming days. Argentine President Mauricio Macri was in Santa Fe and accused the previous government "This has happened because many years passed and no work was done"
More than 40,000 people affected and millions in losses in infrastructure and agricultural production is the new balance of flooding on the coast, while the Weather Service forecast more rain for tomorrow and Monday. "We counted 40,000 affected," said Interior Minister Rogelio Frigerio at a news conference with his pair of Agro Industry, Ricardo Buryaile, and the governors of Santa Fe, Chaco, Corrientes and Entre Rios. Buryaile said that the agricultural sector lost "between 3.5 and 3.8 million tons" of their crops, mainly soybean, which estimated losses "1,000 billion dollars." The Argentine President, avoided mentioning the relationship between the extent of soybean monoculture, clearings, deforestation, and floods. "We are very worried. 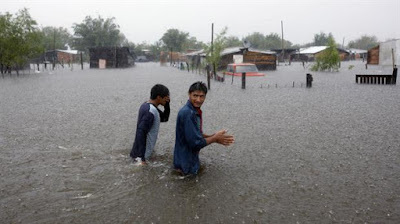 This is the first time in decades when floods cover the entire area of Santa Fe after 20 days of incessant rains, "said Miguel Lifschitz, governor of the province. 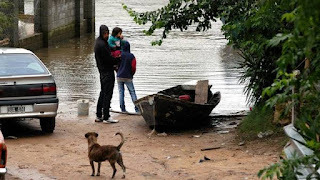 Meanwhile, the head of the municipality of Presidente Roca, Castellanos department in the west of Santa Fe, said that "the landscape caused by flooding is devastating. It will very difficult to overcome this situation. " According to the Government, the loss amounts to 3.5 million; according to the Rosario Stock Exchange would be 2 million; and according to private estimates would be 5 million.